Noizeworks Live Sound Technical Stuff Blog: Stageboxes, Multicores, Balancing and D.I. Boxes. Part One. The Noizeworks technical blog is where we publish posts designed to help musicians, sound engineers and anybody involved in live events understand a variety of live-sound concepts. The posts are often inspired by questions and subjects we come across on a regular basis from customers. Please subscribe for regular updates and please feel free to leave comments about the blog or to provide additional info readers may find useful. Stageboxes, Multicores, Balancing and D.I. Boxes. Part One. Stageboxes, Multicores, D.I. Boxes and Balancing Explained. Part One. What does a D.I. box do? What does balancing mean and why do my signals need to be balanced? What the hell's a 'snake'! Why shouldn't I plug my keyboard straight into the multicore? If these are questions you don't know, or only partially know the answer to, then this blog is for you. We'll debunk and de-mystify these sometimes mis-understood items and concepts, not only in live, but also studio sound. It's quite a lot to take in, so we've split it into three parts. In part one we'll deal with multicores and stageboxes in a simple live setup using a single mixing console. In part two we'll look at more complex setups where a monitor console is introduced and in part three we'll look at different types of multicores and also the role of D.I. boxes and explanation of signal balancing. The live sound engineer, or 'front of house' engineer needs to be positioned 'out front' somewhere within the audience area so he can hear the 'front of house' sound system and hear what the audience is hearing. Anyone who has attempted to mix a band from the side of the stage, behind the main speaker system, will know what I'm talking about. A multicore is basically a bunch of mic cables within a single, large jacket, that is used to transfer all the signals from the stage to the mix position, somewhere 'out front', and also to 'return' signals back from the mix position to the stage area once they've been mixed and processed, etc. The fact that all the channel signals are contained within a single large cables greatly simplifies system setup. 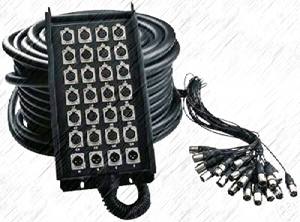 Naturally, it is much simpler to run a single cable from the stage to the front of house mix position. Imagine having to lay 24, 32 or 40 individual mic cables in 50 metre auditorium. 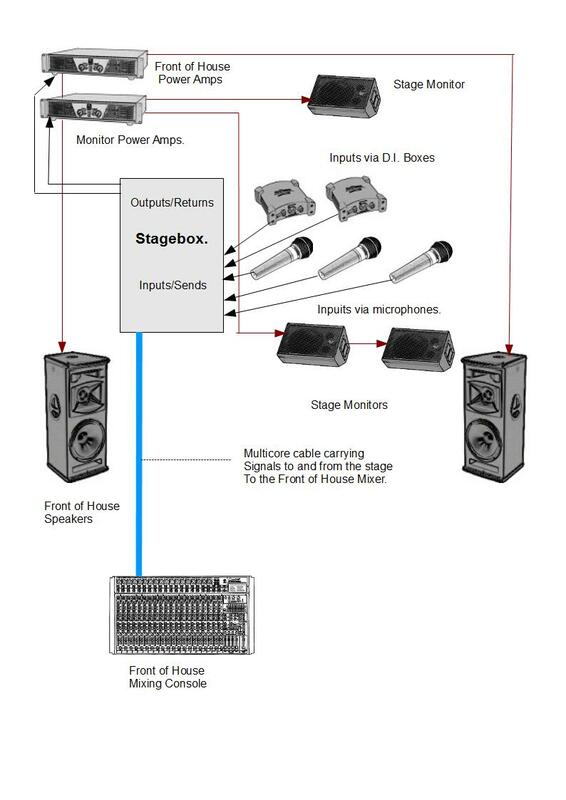 A multicore system usually also includes a stagebox. 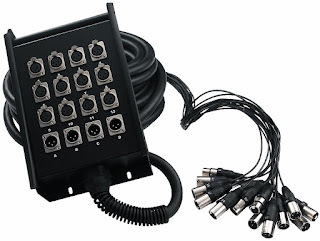 This is a metal box with a number of (usually) XLR connectors into which all the mics and instruments are plugged into. Each connector corresponds to a channel within the multicore cable, which is then (usually) connected to the corresponding channel on the front of house mixing console. The stagebox is also used to patch 'returned' signals from the front of house mixing console through to the amplifiers driving the front of house loudspeakers and/or the stage monitor speakers. So the stagebox really becomes the 'hub' of a live audio system through which all the individual signals that make up the system are patched and pass through. If you look closely at the stagebox, you'll notice that some of the connectors are female XLRs (sockets) and others are male XLR connectors (plugs). The female XLRs are the inputs (or sends). These are used to plug in the signals from the stage including microphones, as well as feeds from electronic instruments e.g. keyboards, and electro-magnetic pick-ups e.g. acoustic guitars fitted with pickups (The latter two input types should always be patched via a D.I. box. More on this in part 3) which are then 'sent' to the front of house mixing console via the multicore. These inputs are numbered and correspond to the numbering at the 'tail end' so each channel can be identified at each end. The male XLRs are outputs (or returns). These are used to feed the signals that are 'returned' from the mixer (possibly via processor or processors such as graphic EQs, crossovers,etc) to the amplifiers that drive the front of house and/or the monitor speakers. Or directly to the loudspeakers if they are active/powered speakers. Again these are numbered and correspond to the numbering on the return connectors at the 'tail end'. The multicore cable is essentially, as mentioned earlier a bunch of individual cables contained within a single jacket. They are arranged in pairs with each pair containing two 'cores' (positive and negative) and a shield (ground). Just like an individual mic cable. This is where the individual channels of the multicore 'fan out' to be plugged into the appropriate channels of the mixer. The connectors and sometimes the cable are individually numbered and correspond to the channel of the stagebox. Stagebox/Multicore systems vary in complexity and length. They may be 10 metres long, they can be 50 metre in length. The can carry 8 input channels and 0 return channels or they can have 48 inputs, 12 returns and beyond. The two numbers used in multicore specs refer to the number of input/send channels and the number of output/return channels. E.g. a 24/8 multicore has 24 input/send channels and 8 outputs/returns. This diagram shows the signal flow around a typical live audio setup with a stagebox as the 'hub'. Hope this all makes sense so far, In part two, we'll take a look at a more complex setup with a dedicated monitor mixer, and in part three well look at optimising signals for transfer down a multicore. i.e. D.I. boxes and balancing. This post was written by Simon Thompson. M.D. of The Noizeworks. Specialising in the supply of live sound audio products including multicores. He has run his own live sound hire equipment company and been a live sound man for twenty years plus. He also sniggers inanely when he remembers that the German word for 'right angled jack plug' is 'winkelklinkenstecker'. I found this post really really helpful, thank you. Any plans to write part III? Thank you for your comment. I'm working on part three now. Should be posted 1st week April 2014. Simon. Noizeworks.